Accountants love working in Excel, and they didn’t get this way sorting a thousand rows by hand. You can thank softcopies for misplaced USB thumb drives full of sensitive information and confusing e-document retention policies. Softcopies are the electronic source of the paper printout. Before a schedule is printed out, it typically exists in a software format. This could be .Xls, .Pdf, .Doc, etc. Accountants rely on having the softcopy (.xls) as opposed to the hardcopy (paper). Accountants are known to spend over an hour looking for the softcopy in their e-mail inbox before requesting it again from the source. Besides adding everything to a pending list, accountants also instinctively ask for the softcopy. This is second nature, because an accountant who has received only a hardcopy has in reality received nothing at all. When an accountant is not able to get the softcopy version of a document, it is considered desperate times. They may resort to OCR document scanning or recreating the document in Excel manually. These alternatives do not work very well and allow accountants to go over-budget earlier than planned. If you ever have to deal with an accountant, you can save some time by giving them softcopies of the document instead. That way, you save yourself a trip to the printer and can say you are doing your part in the company’s green initiative. All praise the softcopy and electronically footed schedules. 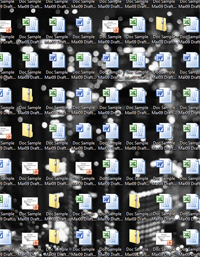 I love it when the engagement is over and I can remove all the soft-copies from by desktop. To folders by client of course, in case I ever need that info again. You see the financial condition and the statement of income. Yet, this is not the reality. What really exists? Another step is needed. You go into the books, you see the nominal and the real accounts. Yet, this is not the reality. What really exists? You go into the real accounts. There is at least one law of thought which must be observed in all accountants: the law of non-contradiction (an asset cannot be a liability in the same respect, and at the same time). This law comes after the 1st law: the law of identity (an asset is an asset; a liability is a liabilty; and, equity is equity). There is still one other law, the 3rd law: the law of exculded middle, only debit or credit (the two ways, left or right, true or false, good or evil). You test the accounts for coherence, ever see a one sided journal entry? There are no uncaused events in the accountants’ world. Capital does not arise out of a true vaccuum. There is no something from nothing. Entities do not pop into existence from a big bang. There are the creators. The stockholders, and the 3rd parties from which the capital comes from. That which sustains the stockholders, and the 3rd parties must be real. That is, what is self-maintaining is real. Matter is not self-maintaining. Remember, there are no uncaused events in the accountants world. As accountants, we can not give up our reason, the laws of thought; we can only give up consistency, our integrity, and need for meaning. Do you claim to know what is real? Have you looked beyond the balance sheet, what you see on paper? Philosophy of accounting begins with testing one’s closely held assumptions. Have you tested your assumptions?